Health and Safety never go out of style. 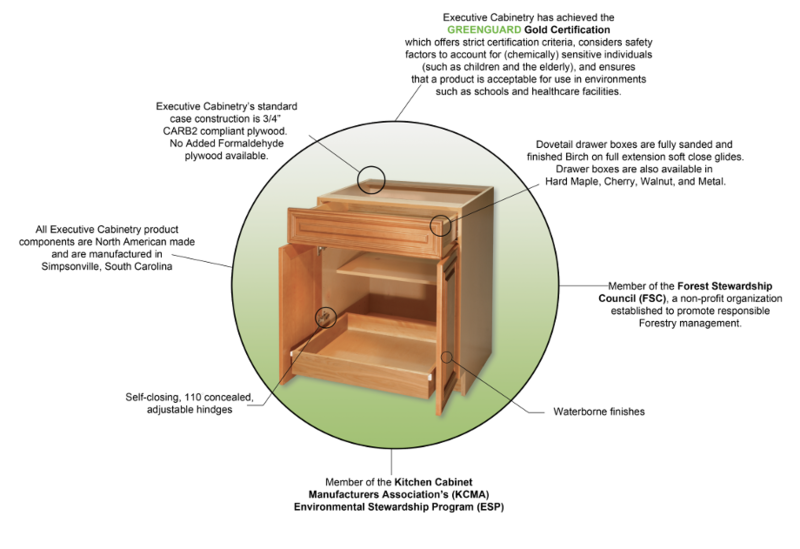 With this in mind, Executive Cabinetry manufactures the most environmentally sound cabinetry the industry has to offer. From responsibly harvested wood materials, to all waterborne finishes, Executive Cabinetry lets them breathe easier with the healthiest kitchen available on the market. We are devoted to building our products with wood from managed forests and rapidly-renewable resources, only. Our waterborne finish captures or eliminates chemicals that would otherwise release into the air in your home. We submitted our products to GREENGUARD Environmental Institute to undergo intense scrutiny and have subsequently earned their highest level of certification; GREENGUARD GOLD. We believe your family deserves a healthy kitchen at no extra cost and conservation without compromising quality or personal expression. We offer a great selection of door styles and finishes available on the very best box construction, at surprisingly affordable prices. GREENGUARD Environmental Institute is an industry independent, not-for-profit organization recognized as a leader in establishing acceptable chemical emission standards for building materials, interior furnishings, cleaners, electronics and children’s products.